For 35 years, U.S. taxpayers facing serious fines and penalties from the Internal Revenue Service (IRS) have turned to Weisberg Kainen Mark, PL, for help in resolving their disputes. The firm’s attorneys provide counseling to clients considering their options, and represent them administratively before the IRS, in U.S. Tax Court, the United States District Court, or when a tax controversy leads to criminal charges. The firm’s third partner, Brielle L. Mark, focuses on counseling U.S. taxpayers with overseas accounts and foreign nationals with U.S. tax obligations. “We have a great team with different areas of strength,” she said. In their practice, Weisberg, Kainen and Mark represent many foreign nationals who are considered U.S. residents for tax purposes. “There are many immigrants in Miami who have had to leave their homelands, and don’t understand our tax system,” said Kainen, who is the firm’s primary litigator. Growing up in Kentucky, Weisberg knew he wanted to be a lawyer at an early age. “My father was in the real estate business, and I would go down to the county courthouse and watch lawyers in court. I wanted to represent real people, with real problems.” Weisberg earned a bachelor’s degree in accounting from Indiana University, and a law degree from American University. “I wanted to get a master’s in taxation and the University of Miami had one of the best programs in the country,” said Weisberg, who earned his LL.M. in taxation in 1974. Like Weisberg, Kainen had always wanted to be a lawyer. He grew up in Miami Beach, where his mother Sarita was a legal secretary. He earned his bachelor’s degree in international affairs at George Washington University and his law degree from the University of Miami. He then worked as an assistant federal public defender for three years, before joining Weisberg’s firm. “I loved that job, but the best way to grow was to explore private practice,” he said. A fluent Spanish speaker with family roots in Peru, Kainen soon added an international dimension to the firm’s tax controversy practice. He also passed those Spanish language skills to sons Elan and Samuel, and improved the fluency of his wife Deborah. She earned her bachelor’s degree in international relations at Colgate University and her law degree at New York University in 2003. She then worked in the New York and Miami offices of Weil, Gotshal & Manges LLP handling corporate transactional matters for four years. That sense of family includes Weisberg’s son Quinton Weisberg, who joined the firm as an associate in 2015 after earning his law degree from Nova Southeastern University. 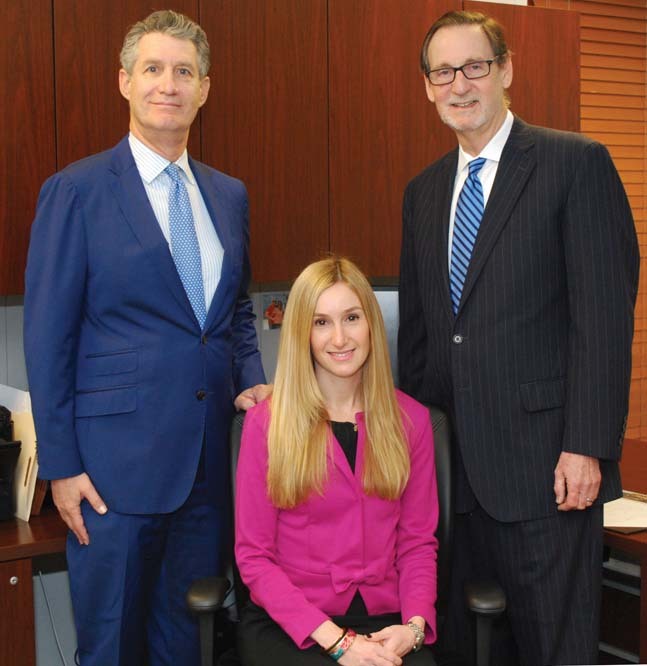 “It is a great pleasure to be practicing law with my son and daughter,” said Weisberg. Mark has also been active in the ADL and the “Put Something Back” pro bono project of the Dade County Bar Association.